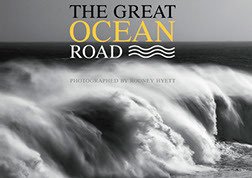 The book is a collection of the best images (mostly in B&W) from 15 years of Great Ocean Road Calendars. The first image is of Queenscliff and thereafter they follow the coastline through to the Discovery Bay Coastal Park, beyond Portland. Accompanying the images is text from two historic journals. The first is the 1879-80 diary of Ernest (Chinese) Morrison’s walk along the Great Ocean Road and the second is Eleanor Parkinson’s account of a three week excursion to Cape Otway with the Roadknight family in 1863. Scattered throughout are old engravings of townships and British Admiralty charts of the coastline, all from the same period as the journals.